A group of wildlife agencies has developed a new statistical approach for detecting chronic wasting disease in white-tailed deer. That’s important because the neurological disease, often referred to as CWD, has spread to 25 states, is contagious and always fatal. Researchers from the National Park Service, the U.S. Geological Survey, the Wisconsin Department of Natural Resources, Princeton University and the Minnesota Department of Natural Resources developed the new way to more efficiently sample a deer population to determine if chronic wasting disease has spread. This technique determines if CWD has spread to a new population, said Dan Walsh, a quantitative ecologist for the United States Geological Survey. It cannot monitor CWD where it already exists. 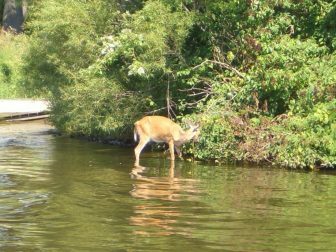 The data collected on Wisconsin deer was key to creating the model reported last June in the Journal of Applied Ecology. They found that older male deer have a higher probability of being positive for the disease. And they weighed how well the other factors predict the likelihood that a deer is ill.
“What that means is an adult male hunter-harvested white-tailed deer is more valuable for CWD surveillance compared to a yearling male that’s hunter-harvested,” Jennelle said. Deer that the model predicted had the greatest likelihood of having CWD were tested. None had the disease, a finding consistent with what the researchers knew about that population. The implications of the study are important for more efficient testing.